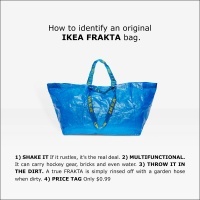 Widespread outrage and ridicule followed the news that Balenciaga had brought out a blue leather bag bearing a striking resemblance to Ikea’s famous FRAKTA tote. One major difference was in the price: Balenciaga’s retails at £1,705, Ikea’s costs 40p. For those in the fashion know this was another example of the playful wit of Balenciaga creative director Demna Gvasalia. At his own label Vetements, Gvasalia has been known for his ironic appropriation of branded, corporate clothing, such as a reproduction DHL company T-shirt. The Ikea-like bag was the latest in this vein. 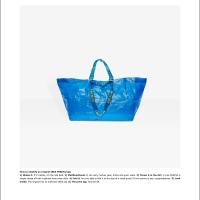 Ikea appears to have taken the whole thing with a sense of humour: its agency ACNE came up with a quicker response in a print ad giving customers some ‘tips’ on how to know that their Frakta blue bag is the real deal.